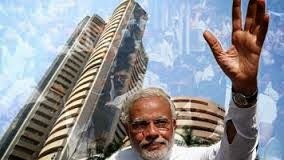 9:50 am Breaking: The Sensex is up 1,390.96 points or 5.82 percent at 25296.56, and the Nifty is up 417.90 points or 5.87 percent at 7541.05. About 1122 shares have advanced, 531 shares declined, and 55 shares are unchanged. Global Trade Tumbles Most In 5 Years. Wanna Be A Great Trader? Finger Size Matters. The Indian Election Is Over, The Full Summary. NIFTY Could Top Around 7225-50 By 25th May 2014.